The Kahles K16i delivers unmatched optical performance. The K16i is in its own class. The K16i has the clearest image edge to edge, the largest field of view, true daytime illumination, and a variety of innovative reticles. It can quickly and efficiently change magnification levels even in the most adverse environmental conditions with its integrated magnification throw lever. 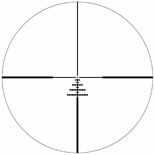 Like all Kahles riflescopes, the K16i is durable, accurate, and its repeatability is second to none. When failure is not an option and performance must be the best, use the Kahles K16i. This is the most advanced low-power variable scope on the market. There is a reason why many Pro-Series 3-Gun competitors choose the Kahles K16i - it delivers for even the most demanding shooters.